The Gladly first opened its doors in the fall of 2013. Serving lunch, dinner & happy hour, Chef Bernie Kantak creates unique and extraordinary cuisine intriguingly infused with inspiration from his travels. The bar is heavily stocked with over 250 whiskies and inventive cocktails, plus crafted ice balls available for an even more extraordinary drinking experience. Groups can choose between a 30-seat semi-private mezzanine level dining room or a fully private banquet room with enough seating for up to 60 guests. Situated along the Camelback Corridor, The Gladly has the spirit and vibe of the big city with an earnest and comfortable atmosphere. Lioco Chardonnay, La Marisma Vineyard, Santa Cruz Mtns. A great place for cocktails and excellent food. Great vibe and energy here! Came in for the chopped salad which is very good, but does not compare to the same salad at a their sister restaurant in Old Town. Portion appears smaller and very stingy with the smoked salmon. Paired the salad with their version or fish taco's based on the recommendation of our server. The tacos were dry, greasy and with marginal flavor. Sunday Brunch on the patio is a favorite: chilaquilas or churro waffles are worth every decadent calorie. My other favorite is the steak/blue cheese salad with bourbon-soaked cherries. And the service was impeccable: our waiter made wonderful suggestions when asked and was attentive. Like to explore new dishes? This is the place! Varied menu leads you wanting to come back for more. We had a a birthday brunch and not a single person (6) was disappointed with the cuisine. We loved it! I have shared our experience with all of our friends and can't believe we haven't tried it earlier. What a great dining experience. The blood orange sorbet mimosa was outstanding, as was the spicy bloody Mary. They have the unforgettable, deliciously famous chopped salad (Yay!) and fabulous egg dishes...loved the truffle grits and eggs! For dessert, the blueberry maple bread pudding defies comparison for deliciousness. Do ya' think we liked it?!? Heard from friends this was a fun place and they were right! Was thrilled to see the Chopped Salad (just like at Cowboy Ciao!) and thoroughly enjoyed it. Three of us shared additional small plates including the Brussels sprouts--yum--just wish there were more on the order. Ice cream dessert for my 62 year old birthday boy was perfect. Already recommended it to friends visit From out of town. Can't wait to return! Service was slow, but service staff was pleasurable. Food was over cooked and just bad! Had the bone in pork wrapped in bacon. All fat in the pork, bacon was over cooked like a cook would do not a chef, Peray sauce was delicious! Ambience from the windows is spectacular and fun to people watch. prompt service , food was great , prices were fair for the quality of the food. when our server Courtney learned it was our anniversary she had our bill adjusted as a surprise for us, plus she was very busy with other tables but took care of everybody wants and needs. over all great experience. We had a wonderful experience! Excellent food, and spectacular bar options. The sides were bigger than we expected, so best for sharing rather than taking as a small plate. Service was very attentive without hovering, and all staff very friendly. Atmosphere was nicely energetic without being too loud. A little too cold for the patio tonight, but it would be lovely in warmer weather! Would definitely recommend this restaurant to our friends. Great night out with my spouse. Fantastic dessert! Don't skip it. Love the Ice-Balls! And the fact that The Gladly now rotates periodically the causes supported through Ice_ball purchases is awesome! Memorable experience. Can't go wrong with a meal at the Gladly! The Gladly is definitely a consistent, high quality restaurant that I frequent as often as possible. Solid service; servers and bartenders really know their stuff. Drinks were superb, as was the food and pairing. Def a step up from Citizen Public House, which is one of my favorite spots in Scottsdale. Terrific food as always.. little too noisy to be an intimate date place. Just not for us. Overpriced and not the kind of food I like. Trying get to hard. I left hungry. Enjoyed all courses. The arctic char fish was outstanding. I tried the French toast - probably the worst I've ever tasted - soggy center, crust too tough to cut. Service was poor, signage to find the restaurant also poor. Not going back. Wow! Over the top spoiled! They treated so beautifully. Our group grew from 7 to 10 just before the scheduled reservation. Despite that surprise the meal and all of the pairings were fabulous! Always glad to be at the Gladly with friends. The servers don't rush you out and are very good at refilling glasses. Our meals were delicious and it looked as if we licked our plates. We left well satisfied and happy. We were too full but had to share between the 4 of us a taste one of their unique deserts. Glad we did! Parking on the upper level is really easy too. We had a quite table in the corner by the window and that really let us socialize and catch up. Creative and tasty options. Contemporary ambiance. Grown-up place. The staff, food and vibe are always 'just right'! We frequent The Gladly and recommend it to others often. Keep up the great work and thank you for bringing such a great place to our neighborhood!! Great restaurant with a real nice ambiance. Food and drinks were excellent, along with the service. Our service was awesome. The food was outstanding. We will definitley visit again. We had a wonderful experience at the gladly. Service was really over-the-top, it's clear Mick and everybody else really cares about making sure you have a good experience. The food was very delicious with a decent variety of options. The osso bucco was good but the duck meatloaf was outstanding. The crabcakes and chopped salad were also very good. We had a side of brussels sprouts on a creamy polenta with truffle oil and parmesan cheese that was yummy. The wine was a decent selection and we enjoyed a glass of sparkling rose, Pinot Noir from California, and a CDP type blend from California. The Pinot made the best pairing with the duck but the CDP was delicious on its own. We were too full to try dessert but they looked very inviting. We sat outside and the ambience was very nice. It was also a quieter out there. The inside had a very energetic vibe and was packed full on this night. Our waiter Tom provided excellent service throughout. The bourbon drinks are wonderful & it's always fun watching them make the ice. The Brussels sprouts were to die for as well as the duck meatloaf & the filet mignon. Overall, the Gladly always provides a great dining experience. Can't wait to go back. While our server, Kathryn, was the best part of this dinner. excellent and very helpful, its too bad we can't say the same for the ambience, food and value. 5 of us shared 3 light plates/apps and only the tuna plate was very good. The crab cakes were mushy and bordered on a fishy taste, while the octopus was tough, chewy and not all that flavorful. 4 of us had the $20 hamburgers, which were only a little better than bar food. The fifth of our diners had a salad that she said was good. The noise level is very loud. Bottom line, The Gladly is nowhere near the quality and experience you'll have at its excellent sister restaurant Citizens Public House. Go there instead! Tim has always treated us special guests, he is a big part of why we return! The scotch selection is wonderful! Wonderful time there. Tim (our server) is truly original and a master of his craft! Mic was our server for lunch and was fantastic. Kat was our server later in the day for a happy hour meeting and killed it as well. \n\nThe 2 experiences yesterday 02/07/2017 couldn't have been any better. Cocktails were fantastic and the food was fabulous. Had an issue with my octopus that I was going to work through on my own. It the staff was on it; our server took it off the bill without request. Great service. Highly recommend. The staff was very prompt and never left you with an empty glass. The location and parking was easy to find and accessible. The food was a little different from my normal diet but was great none the less. This place has become my wife's favorite. This was our third or fourth visit to the gladly. My meal was excellent but, of course, I ordered the chopped salad - their signature dish and my all time favorite. My husband ordered the filet - not because he 'loves filet' but because nothing else was of interest. That said, the filet was good, just not very interesting. The others in our group ordered the steak salad - dull! And the scallops - under cooked. Our desserts were delish - banana creme jar and tres leches rum cake.\n\nWe like the Gladly and we will definitely go back, but with the plethora of really great restaurants in Phoenix I think they need to amp it up a bit! Unique menu. Relatively limited menu. Food was good, nothing to return for. Were looking for a nice place to dine and have a drink, prior to going to the Phoenix Symphany for a show. Gladly was close to the 51, and quick to downtown. Food was very enjoyable and set the tone for the evening. Scotch lovers home, plus regular drinks and wines. Will be back. Our waiter was the best, fun and passionate on the food and restaurant! We loved the ice ball drinks and delicious dining. Definitely will come back! Great food, nice atmosphere and even better service. Very impressive. We tried the famous 'original' chopped salad. Then, ordered another! Main course great too! Great place!! We had 10 people and ordered several different things and we all shared. Everything was really good!! The Gladly is a solid choice for dining. If you haven't been to it before, rest assured you can come here for the first time on a special occasion and it will be a good experience. The chopped salad is the best and most unique combination of flavors you will find in Phoenix. And if you like bourbon, you MUST experience The Gladly. Food - excellent blend of flavors, good size portions.\nService - attention to details and knowledge of ingredients was outstanding.\nVery enjoyable experience! This restaurant is consistently excellent The whiskey selection is extensive. Nice restaurant. Food is very good, great ambience. Nice people. Nice restaurant, hopping scene, good ambience if you like high energy. Not an easy place to have a quiet conversation. Service was excellent, pleasant waitress with water glass always filled. And that was a good thing because although my wife and I found the food okay, it was too rich and on the salty side, which required the water. Had the duck meatloaf and scallops. Like I said, although good and a different tasting experience, not dishes we'd go back for. What was memorable was the chopped salad. Would return for that dish. As for value, when dishes bump close to or at $30, you expect more. Great fixed menu for New Year's Eve. Delicious scallops!\nAttentive service! When I asked for my check, I was told it was taken care of. To my surprise, I found out that it was from the restaurant management wishing me a happy new year. What a nice gesture! No one has ever done anything nice like that for me. The manager even walk me to my car. What a wonderful way to start off this new year knowing that there are wonderful people out there.\nIt made me cry. Thank you Gladly Restaurant! We have eaten at the Gladly twice and both experiences were amazing! I would definitely recommend getting the ice ball for your whiskey or cocktail. The chopped salad lived up to its hype! The cocktail menu was great too. Interesting place, but not worth the money. The food was OK. The seating is not warm and intimate like the Hillstone. I doubt if we would return. All of our meals were delicious. We had the Chopped Salad, Mac & Cheese, Brussel Sprouts, Wagyu Burger, and the Sword fish special. The pressed ice ball they make for you if you drink whiskey is a great add and for a good cause. Great place to come if you love food and whiskey. What a find! We had the Brussels sprouts over cheesy grits. They were amazing! Then we shared the steak salad.. The steak melted it my mouth. We can't wait to have another meal there when we are in the area! Restaurant was incredibly noisy. I had the fillet mignon and it was pretty good. The dessert was dry and tasteless. For the money my expectation was higher. We chose The Gladly to ring in the New Year. I hope all of my decisions in 2017 turn out to be this good! Been to the Gladly a few times and I've never been disappointed. If you're into single malt, the list is the best I've seen in Phoenix. Started with the charred octopus which was delicious, but not cheap. The chopped salad is the famous one around town. Scallops were fantastic and the chicken breast was really tasty. Great accommodating service. Gladly is a date night place for us, always good. Great date spot on cameback road. This place is always packed for weekend dinner so make sure to book a reservation. Food and drinks were delicious, the staff was fun and attentive, as always. My favorite restaurant in Phoenix. Great food, great cocktails, wonderful people working there. Dinner was fantastic. The food, drinks, service and atmosphere were great. I'd highly recommend this place to anyone. Everything about this place was amazing! I will definitely be heading get there again soon. I as pleasantly surprised. The photos on the net do not do the interior justice. The service was great; the food outstanding. Try the duck meatloaf!\n\nWould go back in a heartbeat. Service was excellent. Very attentive staff. We had a great time and a fantastic meal for our holiday dinner! Can't wait to eat that salad and the octupus again!!! Excellent service. Our server was solid! He knew his products and was very personable. Amazing experience! We were treated like kings and the food was spectacular. BBQ egg rolls, Brussels sprouts, tuna in brown butter sauce, Thai margarita... can't go wrong!! We went with a small group of friends for my husbands birthday and the service was exceptional along with the food! This was my groups 1st time dining at the gladly, but my 3rd and every time the food is stellar! Great venue for any occasion! Killer cocktails ( holy water) the duck meatloaf was it good! Uber rich but still outstanding. Wonderful dining experience with excellent craft drinks and attentive wait staff. Plan on repeating soon. Great atmosphere, food and service! Will be going back again! Food and Beverage excellent. Perfect service from Cat. When Peg and I want to go to a special place to relax, enjoy great food and service, and overall just take a few deep breaths, The Gladly comes to mind. Saturdays at 4:30-5 PM is like having our own private dining experience with Kat providing incredibly attentive and professional service. Chef Bernie and Ben have changed the menu and it is something always to look forward to. The raw bar is incredibly good and can be had as an appetizer or a full meal. I would strongly recommend that you visit this place for whatever occasion comes your way. It was our 38th anniversary. The food was outstanding and service was the same. Enjoyed the meal. The cocktails, the salad and the entrees. However the decor and location feel more like a hotel lobby cafe over a high priced fine dining. And while the food met our expectations and was priced accordingly, the location felt more akin to a mid priced chain. \n\nThe location could use some art, much better flooring and a little warming up... If you're going to charge fine dining prices match the feel of the restaurant to that goal. Good food, good service and otherwise a great meal. Our first time at The Gladly and we loved it. It happened to be restaurant week when we went, so it worked out even better. The food was great and service was even better. Our server (I think her name was Marisol) was awesome! The original chopped salad was delicious as usual (same as the sister restaurant - Citizen Public House). If you like duck, try the duck meatloaf! The Apple Bourbon bread pudding and chocolate torte were great as well. Highly recommended and we will definitely go back. Not only is the food amazing, but you can bring your dog onto the patio. Wonderful! Hostesses are especially charming. Found the menu somewhat boring and was surprised they no longer offer gluten-free breads. I had heard so many good things about The Gladly and was disappointed. Maybe a better Happy Hour-type location. I was on vacation and my friends insisted we go... Loved it! Great job all. We were looking for a restaurant for a birthday dinner. Coincidentally it was Restaurant Week, always a great time to visit someplace we hadnt been. Based on a recommendation from our daughter in law and a quick peek at their $33 special menu, we chose The Gladly. Iur entire experience was first rate and we wil be back. The ambiance is bright and open...very inviting. Our server was friendly and knowledgeable. I appreciated knowing that their scallops are usually done medium rare. ..I requested mine be done medium and they were perfect. The chopped salad was excellent (we have enjoyed it at Cowboy Ciao and Citizen Public House previously ). My husband said the duck meatloaf was delicious and we both devoured the chocolate tarts for dessert. If our good weather holds, we would love to give their spacious patio a try next time. Our only complaint was that parking was a bit of a challenge, but perhaps a non-Restaurant Week visit would remedy that. We took our adult kids and their significant others to The Gladly during Restaurant Week. My husband and I had been there previously, and we completely loved it. Our kids were super impressed with the restaurant and cannot wait to go back. We started with the chicken liver pate' and drinks. My son had the Gladly Manhattan and said it's the best Manhattan he's ever had. His girlfriend had the Death of a Cosmo. We all tasted it. Amazing! The Restaurant Week menu was great. Their Chopped Salad is one of the best chopped salads I've ever eaten. I chose the scallops, my husband chose a pork chop, my son's girlfriend chose the duck meatloaf. Her mother is French, so she was raised on French cuisine. She was super impressed with the meatloaf. The Gladly is one hot spot. Go. Just go. My girl friends and I celebrated restaurant week at Gladly's. Our waiter was great and made the meal more fun. Wonderful choices. Glad we took the time to come. The restaurant is beautiful. Service was truly outstanding. We liked everything we ordered. House greens were light and fresh. Chopped salad is amazing but could be a meal so share. Meatloaf was amazing - unique and incredibly flavorful and rich. Seabass was delicious. Steak was quite good as well. Would highly recommend this restaurant for dinner. My husband and I tried The Gladly when it first opened and it was fun however found the food (we tried several of the small plates) to be just OK. We went back last weekend and found it to have a new cocktail list and revised menu. Bartender was great, server at dinner was friendly/paired a great wine with my entree and both my husband and I had great meals. A much better experience overall this time around. We will return sooner next time! The Gladly is outstanding!! The food and atmosphere made for an amazing evening out. Had an awesome birthday! Food was very good! Service was excellent! Try the couscous salad! Highly recommend this wonderful salad. Great combination of smoked salmon, house made trail mix, etc. am going to try at home. I had a great cocktail (the garnet & grandeur), amazing butternut squash soup, and the always tasty chopped salad. Sea bass was overcooked. Scallops were great. After hearing so much about the famous Gladly chopped salad we had to go! It did not disappoint! (Anything with its own Facebook page must be good right?) Our server was very knowledgeable and answered all our menu questions with ease.\n\nIf you like whiskey this is your bar! It is worth it to try their famous pressed ice ball to go with it (it lasted for 2 rounds for me), but they also have an extensive wine list to choose from. We tried a few starters including the pretzel, sausage and cheese which was delicious.\n\nIt does get quite loud when the restaurant is full and service slowed considerably. We also had to send our 'eggrolls' back since they were cold in the center, but management quickly apologized and took them off the bill.\n\nOverall we had a great time and would definitely go back to try more whiskies and eat that salad again! We love dining out, and enjoy good food, but one of the key ingredients to a pleasant experience for us is the ability to converse. While the whiskey selection was amazing, the service warm and capable, and the food very good, we will not return because the noise level was just too unpleasant. The concrete floors and glass windows, coupled with too many hard surfaces made a restaurant experience that was uncomfortably loud. I suggest the patio if you want to converse. If you don't mind a noisy 'energetic' environment to dine and converse, try it - the food is quite good. It was a nice lunch, the service was good, as well as the food. I had a friend with me who had never dined there before and she really enjoyed it. The food was just OK. I thought the short ribs were too fatty...probably 40% fat. Other food was good but nothing spectacular. Service was great! Consistently great food coupled by service that is friendly, knowledgeable and attentive without dominating the dining experience. We tried this resturant during resturant week. The resturant is beautiful, ambience great, host very friendly. Our waiter was amazing and showed up at appropriate times without hovering. Our food was excellent and presented beautifully. I recommend the Gladley and look forward to returning when we can enjoy one of the fine wiskey's and not rush off to the symphony! Love this restaurant. Been there a few times and never been disappointed. The minute you walk in you can tell it's going to be a great experience. Very creative menu. Food and drinks were great. Service was exceptional. A nice mix of people. \nWe'll be back. We went on a Friday evening and even at 5 pm the mood was lively! We were seated right away and our waitress, Kat, was very attentive. She gave us great ideas on what to order and everything was great...particularly the Scallops, which were cooked to perfection! Great neighborhood place as well as a date night dinner. We sat outside and the road noise was a little loud at rush hour but honestly the food and service were so good, a little noise was no big deal! Highly recommend! Also if you are a Whiskey drinker, you will love this place! Lots of options and all are excellent! The original chopped salad deserves to have its own FB page and following. The cocktails are outstanding and the bourbon list is the most impressive I've seen. Be sure to pay the extra few bucks for the ice ball....def worth it. The food was so delicious I didn't want to stop eating. Hands down one of the best meals I've eaten in a long time! I have passed The Gladly often and finally made it in. Glad we did. Wonderful place. Excellent food, great service and refined ambiance. Next time we will try the outdoor space. The good in general was good. One plate- the octopus- that was recommended by the wAiter was few bites of over cooked fishy tasting octopus. They did not charge us for the plate! This could have been. Four star otherwise! Music was a bit too loud to have a great conversation with 7 people. Christine and her team do an amazing job each time we visit the Gladly. The team members at the front door are professional, courteous, and make you feel very welcome. 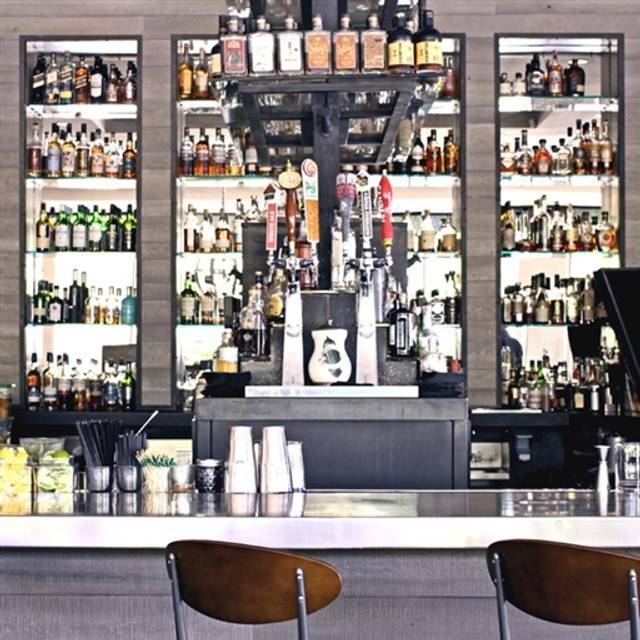 The bar team will craft cocktails that are perfect every time and all of them are great conversationalists.\n\nThe servers are knowledgeable, efficient, and attentive. Without exception, everyone who comes to your table will make you feel welcome. The food, not even sure what to say. It is incredible. We have tried many different menu items and never been disappointed. The Hillbilly Egg Rolls are going to be famous one day, I am sure! \n\nThank you to the entire team at The Gladly for making the evenings we dine there so pleasant. This was our first visit to The Gladly and we were very impressed with the service and the food. We were greeted professionally and courteously upon our arrival and made to feel very welcome. We spent some time at the bar to have a cocktail before dinner and all of the bartenders greeted us and took exceptionally good care of us. We had a few questions regarding the restaurant and how they prepared some of their specialty cocktails and they were happy to share the information with us. It was very enjoyable.\n\nWe moved to the dining room where our server, and the rest of the service team, all welcomed us graciously. We asked some questions about the menu and our server was able to respond to all them. Very knowledgeable. Our appetizers arrived timely and both were delicious. As our entrees we ordered the Filet Mignon and the Sea Bass. Neither of us could find enough good things to say about our dinners. They were spectacular.\n\nThe manager, and the staff, checked with us to make sure everything was to our liking, but did not overwhelm us with visits to our table. We are looking forward to our next visit to The Gladly and know that it will be very soon! Fine food, quiet atmosphere, helpful wait staff. We could not ask for more! Awesome food and server was great! Food was just ok, for the price would have expected it to be over the top good. I could have had just as good of a meal at Firebird's for 1/4 if the price! Met my nieces for dinner. Food was 1st rate but difficult to converse as the noise level is very high. Had the fondue for an appetizer; chopped salad, field greens, and brussel sprouts for first course; and filet and scallops for entree. Everyone loved their choices and the food was really fabulous. Would return but not when communicating with each other was a priority. Small plates were good sized for sharing (for 2) and tasty. Cured steelhead was delicious, served sashimi style. Never disappoints! Great service, easy to hear each other, creative but small menu. Fsbulous porch area. Great sunlight inside. Wide selection of scotch/ bourbon. We visited during Arizona Restaurant Week and it was quite busy on a Saturday night. The menu had some variety to pick from. The Duck Meatloaf and the Scallops were nicely prepared. Staff was friendly and professional with a house full of diners. Appreciated the parking close by the restaurant. Some delicious food for Brunch. Regular menu looks pretty excellent, too. The Whiskey selection is quite impressive. Definitely worth a visit. Great Restaurant Week menu. Fab scallops and grits for me and my husband enjoyed his ciopini. The others in our party were happy as well. Coctails and wine by the glass were pricey. As so many restaurants are the noise level was high.\nService was very good. Charging for bread. Seriously? Ridiculous. A group of 6 had dinner here on a Saturday night. The food was innovative and the quality was excellent. Everyone thoroughly enjoyed their meals. My only complaint is that the noise level was a bit high. It's not the place to go if you are looking for a quiet, romantic evening. Service was outstanding. The selections for brunch were very tasty! We had lovely time after being seated on the patio. I highly recommend it for brunch and will likely try it again for dinner. Always great food and wine. We went for restaurant week and was not disappointed! Great as a date night place or with friends. The dining experience breaks into two parts;\n1. service- excellent service- may have been the best service we have ever received. Waters were filled with table side carafes by wait staff, promptly. Drinks took a little longer than expected but it was a very busy Saturday night and they were delicious when they arrived.\n2. food- the food was good. But we were hoping for exceptional for our 2 person Benjamin Franklin. Over cooked octopus, undercooked Brussel sprouts and an overall lack luster culinary experience. Grits were good, potato side for chimi chicken was good and the chopped salad was amazing. I would not go back , only because there is too much competition to only be good for that amount of money. Excellent food for a decent price, of course. But what distinguishes 'The Gladly' is the friendliness of its wait staff - from server to server assistant to runner. Indoors is a bit loud but the patio experience is divine. We need to eat here more often! We had a great birthday brunch here. The food was delicious and they even brought out cake with a candle. So thoughtful! It's true - the best salad is The Gladly's chopped salad. It has so many different goodies in it and is served like a true Cobb salad would be - in stripes of ingredients. There is freeze dried corn for crunch, Israeli couscous, arugula, small, thinly slices of smoked salmon, seeds, dried currants, and probably more. Then your server pours on the white dressing and mixes the salad for you, individually, at tableside. It is simply delicious. I wish they served bread with the salads, though. You can buy bread, but it isn't worth it. Desserts are great, too. this time our waiter was John and he was extremely helpful with explaining the menu and watching for our needs.\nThe only problem - and it's a big one - is parking. My friends and I are mostly 'ladies of a certain age' (read old) and many of us have handicapped parking permits. There are often no such spaces available, so there is often a loooong walk from the car to the restaurant. There doesn't seem to be any way to improve on the problem, either, because there is nowhere to expand parking. Sometimes when I host guests at restaurants I am disappointed or embarrassed either by the food or the service. At the Gladly both are reliable and are as perfect as anyone could hope to have. Chopped salad is excellent and unlike any other chopped salad I've ever seen. The server adds the dressing at the table and mixes your individual serving, which is gorgeously plated when presented. You feel really pampered. One of my guests wanted brunch/breakfast at lunchtime and was served a perfect mushroom omelet, which she enjoyed very much.\nThe interior is beautifully done and an upscale casual sort of way. Omg the food was so very good. I had the chopped salad and duck meatloaf and it was so good, very different. The ice ball was fun, too. Another excellent lunch at The Gladly. Chopped salad, of course. Easy to have a pleasant conversation with friends because the noise doesn't overtake what is being said. Great menu, apps were awesome. Tim was a great waiter and lots of fun. Don't miss the ice ball made table side...very entertaining. Keep your group small, noise level is high and large groups will have a hard time keeping conversation going. Great food and great atmosphere. Overall service was great. Waiter seemed rushed and eager to get our order and move on. The Duck Meatloaf was outstanding, the cioppino quite good, too! Nice wine options as well. This remains one of our favorite places for dinner. Service is always great as is the food and cocktails. Must get a whiskey ball. The food was amazing. Service was a little slow. Overall, great place! When a restaurant uses Sriracha sauce straight from the bottle as part of the sauce for their appetizer dish, it's not a good sign. I think it was the octopus/potato appetizer dish with the Sriracha sauce on the bottom. Sriracha sauce is put into so many dishes but to see it in a dish from a fine dining restaurant is unacceptable. Also, $30 for 3 pieces of scallops that i can cook at home? Where is the creativity? \n\nThere were 6 people in our party and we basically ordered a variety of dishes but nothing stood out. Always a great time at The Gladly! I met my friend for lunch at The Gladly. We've been there before for brunch and it was just as good at lunch. Our server was very attentive, but not overly so, and the food came quickly and was as tasty as expected.\n\nWe will go back again (and again). My favorite item is the Original Chop Salad. It never fails me! Great place! Inside is really loud but the patio is great. Service was great. Would have liked wine list to include CA & WA wines by the glass.\nLoved the crab cakes and the sausage and pretzel bread. Tim recommended Thai Marguerita, Seared Scallops, Beginners Luck & Duck Meatloaf . . . all excellent. Very cool menu, great service. Pistachio burrata, filet mignon, Thai margarita were all awesome. Went for restaurant week. Food was delicious and service was attentive, but we were rushed throughout the meal. Our salads arrived when we had hardly had a chance to taste our drinks; the dishes were whisked away before everyone had put down their forks for each course, and we were in and out of the restaurant in less than an hour. My absolute favorite place for brunch in Phoenix although it is also a great place for dinner or lunch. Sunday we happened to go for Father's Day brunch, taken care of by my spouse. She knows my favorite brunch. Excellent service by Zach, and excellent food, wine and cocktails. \nAlthough we came for brunch, we had to have the 'chopped salad' as an appetizer. The Father's Day Special with house made biscuit, gravy, sausage and brisket from Little Miss BBQ was recommended and did not disappoint. \nWe always recommend The Gladly for our friends and others. The food was good. The server completely incompetent. She did not know what she was doing and showed up only very occasionally. At one time, I actually had to go to her to repeat a drink order. The Gladly experience is one that I will remember! The food was delicious!! I had to try The Chop and I'm glad I did!! I will be back soon!! The Gladly has tasty food options. I especially like their Happy Hour! Octopus was amazing. Desserts were delicious. Food and service was excellent. Noise level was uncomfortable. We were visiting with a friend from out of town and we had trouble understanding her. They need valet parking. I parked outside the back door. There should be sign pointing to the parking from the front where you drop-off. Loved the ambiance, service and most importantly the food!!! This restaurant is close to work and has a quirky menu with variations on the usual lunchtime fare in the Biltmore area. Wait staff are friendly. We went to the Gladly for my birthday. The service and food were amazing! I let them know ahead of time that I have an egg allergy. When we arrived all of the staff that served us knew about my allergy and they were able to suggest safe options from their delicious menu. Outstanding food and service. Perhaps a little on the noisy side. The Chopped Salad was delicious as always. Love the service from the moment you walk in until the opening of the door when I left. One of my favorite places. I have been here several times and never disappointed. I own a restaurant so can be pretty picky about the entire experience from service to food. Tim was our waiter and was simply incredible. Food was amazing, drinks were great, and service was spectacular. Food was unique, flavorful, but was too rich for my pallet. Sauces on every dish, but had too much oil and hit your stomach real heavy.\n\nService was ok, drinks too awhile to first arrive and the waiter was not the most attentive.\n\nEnvironment was nice, cool, kinda hip and dimmed lights for a relaxing environment.\n\nOverall experience was just ok, I would probably not return myself. This is the second time we've been to the Gladly. Service and food were impeccable. The ambiance is very relaxing. I can't think of anything they could have done any better. Excellent service, very good food, a bit noisy. Nice patio for outdoor dining. Good value for Restaurant Week. Excellent food, service and friendly staff. A recent 'find' for us but have added to our list of favorites. Great food! Great Whiskey Bar (try the ice ball)! There isn't a lot to absorb the sounds so it is a bit noisy. The entrees were very tasty. However, in the opinion of me and the other diners, the desserts were not as impressive... in fact, they were disappointing based on how flavorful the entrees were. We were expecting something extraordinary - the apple bourbon bread pudding was ho hum, the chocolate torte was just okay, and the bacon brittle was 'old' tasting and not worth the time or cost. I think The Gladly needs a good upgrade to its desserts if it is to compete with the other nice eating establishments in the area. Our service was impeccable! The waitstaff and management were incredibly friendly and really made us feel like family. Honestly the best dining experience I have had in a while! Our server Katherine was exceptional. Nice spot. Food was very good. List of whiskies was excellent... Scotch, Irish, Yankee, etc... also a great list of novel whisky cocktails... I highly recommend. First time visit for my husband and I. The service was top notch from everyone we encountered. I was very impressed by how flexible the staff was with accommodating dietary restrictions and enjoyed my slightly modified sea bass greatly! On point cocktails, a whiskey list that can't be beat, and an atmosphere that was perfect for covering and lingering. We look forward to the weather cooling so that we can dine on the patio! The Gladly is by far one of my favorite restaurants in town. This visit didn't disappoint. We had probably the best waiter yet, named Cat and the food seriously keeps getting better there. Started with the brussel sprouts appetizer (heaven), followed by their famous chopped salad (could literally eat this salad every day) and then each member of my party had a different entree. The stars were definitely the duck meatloaf and the beef short ribs. Finished it off with their version of a strawberry shortcake. Outstanding food, service and atmosphere - not one complaint. Can't wait to go back! My husband had the $20 tobacco drink and said it was the best drink he's ever had. He loves anything dark and bitter, and this drink exceeded his expectations. \n\nWe always love the food at The Gladly. Thank you! A Real Foodie Treat! The Gladly is now on my list.\nKudos to our server Kat! Good mix of food, service, and atmosphere. Tried during restaurant week, first time, and got\nGreat meal for $33 per person. Good menu, great food, nice drink and wine list, friendly service...what else could you ask for.\nOnly problem is exceptionally high noise level as restaurant fills. We had a great meal with lovely service outside on the patio. Once Camelback traffic subsided, it was very enjoyable outside. Food was really eclectic and delicious (even the leftovers 2 days later were great!). Only objection was the drink pour. REALLY, REALLY, REALLY small pours. Anything served in a martini glass should be filled to the rim. We received 1/2 pours at best, and received comparable attitude to go with the weak drinks. Had been here for dinner and loved it. Lunch? Not so much. Sat for 10 minutes in 3/4 empty restaurant before server even acknowledged us. Fish tacos were underwhelming and steak on salad was flavorful but tough. Went to celebrate my wife's bday and regret it now. Expected way more. I had dinner at The Gladly on a girls trip this past weekend and it was fantastic - very creative, and delicious, menu options - we all loved it! The chopped salad is a must have! My friend and I met at The Gladly for happy hour and sat at the bar. We were very well taken care of, and enjoyed our beverages and appetizers. I'll definitely be back! Our server was so great! Friendly, not over bearing.\nFood was good, sorbet mimosas were wonderful!\n,Will definitely be back! Anytime there is a special occasion in our household, The Gladly is in always in the mix for celebrating. Chef Bernie Kantak has been a long-time master at creating dishes that are memorableâ¦ with one of them (Chopped Salad) having its own Facebook page! Lex and our server Tim were extremely efficient and personable. We have known Tim since the place opened approximately 3 years ago and he has not lost a step. We started with the Chopped Salad and the Liver Pate, both of which I would highly recommend. I would probably use the mustard that is served with the pate on shoe leather! Peg had the Arctic Char and I had their scallops which are just incredible. We had BBQ pork ribs as an appetizer which could have well been a small dinner. I would highly recommend this place to anyone who wishes to be pampered in an atmosphere that is welcoming and by a chef who absolutely is incredible. The service was good . Food was great . But noise level over the top. Very difficult for us to hear each other and we were against a window away from most of the tables. Peg and I have had the pleasure of going to The Gladly on several occasions, and the experience has always been stellar. I can always take a deep breath and just relax when I get there, knowing that the food, service, and overall ambiance will be terrific. Chef Bernie is always creating new treats and Kat continues to provide superb customer service. I brought a group of colleagues with me this time, and they loved it. I would recommend this place for any occasion! Eating at this place is soo relaxing and comforting. Peg and I went here to celebrate my birthday and it was incredible. Chef Bernie is always stretching the envelope in a very good way and this time was no exception. Beside the usual never-fails (chopped salad, pate) we tried new apps like cold fennel soup with Spanish red crab, ribbits (frog legs....yes...with a wonderfu light batter) and blue cheese waffles, grilled octopus, and a bone-in pork belly bbq-style, and topped with a wonderful Tracy Dempsey Test Leches dessert. This place is always stellar! Kat is always the best....always.... ask for her! Wonderful place for lunch or brunch! Tasty and fresh chopped salad served with a flourish; BBLT is more like a ham sandwich than an actual BLT, but delish! Open, airy atmosphere. Wait staff perfect-- was catching up with an old friend and we were given appropriate time to enjoy a drink and conversation before ordering . Afterward eating , we were given carte blanche with the table. Perfect! \n\nParking a pain (it's the old Ruth's Chris), but you simply need plan ahead and know where you're going. Gotta do 'The Ball'. Ice ball creation in your cocktail. Is $3 extra but a portion goes to Autism research. The braised short rib was awesome. Heath was friendly, knowledgable, helpful and attentive. This was my third or fourth visit to The Gladly, and each meal has been great. They have a nice menu, that includes something for everyone, although they are light on dishes that are vegetarian. Great bar. The place was hopping on a Wednesday night! Great lunch place! Everything was done right! Our first visit here...it was very, very loud. So loud that it was hard to carry on a conversation with people at our table (table of 4). Our main course took around 1 hour 15 minutes to come out. Our waitress seemed to forget about us during this time as she was clearly busy with other tables. The food was just ok. Don't think I will return. The food was to die for. incredible service. loved it. I recommend the sea bass. We enjoyed eating lunch at The Gladly. The food was delicious and I especially appreciated that the noise level was at a low level so that we could converse. Very cool presentation of their Beginners Luck (Woodford Reserve Bourbon). I ordered the 'ice ball' with the bourbon. They prepare the ice ball at the table with this cool aluminum press, place the ball in your rock glass then poor the bourbon. \nHad the fondue - very good ...tasty. \nNice restaurant overall and the staff was very friendly. Corned Beef & Beet Hash was delightful. The cibatta was so soft. My DH had the tender belly blt and said it was the best ever, the brioche bread was excellent. Also have a nice selection of cocktails with a strong emphasis on bourbon, but still a good selection for the women who don't drink whiskey. Excellent around, great food, excellent service. We the beef cheeks, scallops, pork chop and chopped salad. Everything was excellent. Dinner on Mother's Day was a disappointment. It felt as if the 3rd string was left in charge and the meal was quite uneven. The scallops were delicious but too many other issues for the prices charged. Here are the comments.\n--The pork chop was served cold in the middle and did not taste very good. After we sent it --The still water is WARM Phoenix tap water that tasted unfiltered and looked like it. Yuck!\nback, the flavor was excellent and it was still moist and tender.\n--The same creamy grits concoction was used for both roasted brussel sprouts and the scallops. Too much!! A small portion of the grits were OK, but they were bland and very rich. The brussel sprouts small plate had a small portion of brussel sprouts and way too much of the grits. All the other portions served were large.\n--The service felt unfriendly. We still fondly recall our servers from previous visits. Churro waffles! Mind blowing. Thanks for being amazing! Food was great, our server Tim was great, drinks were great, just a little loud. We are still talking about the ice ball, glad Tim recommended it! How could I have forgotten about you! From start to finish, this place is superb!, the food and drink outstanding and the service true perfection. I cannot say enough good things about this place! Cant wait to hurry back! great food and service. a bit loud for a business lunch. Way too loud with concrete floors and lots of glass Had a group of loud drunks left over from happy hour talking extremly loud during our whole dinner. \n\nService was good but bar was slow because it was backed up from happy hour. \n\nFood was excellent. Three of us went to The Gladly for Restaurant Week- always a hit event and even more special at The Gladly. Service was good, though the busy-ness of the place caused some slight delays. The atmosphere was just fine- a little loud, but just part of the setup. The food was fantastic- the duck meatloaf was incredible as were the other dishes on the menu. We will definitely go back! Waitress couldn't remember specials, had difficulty answering questions, served specialty drink with a bug in it. Disappointed in flavor & presentation of food. Went there to celebrate my wife's birthday. We did not realize until we arrived that it was restaurant week. We were seated fairly quickly (we had reservations) and the waitress was quick to drop off menus and ask for drink options. We placed our orders for food and drinks, all of which were very tasty. However, they failed to provide simple things like silverware (i.e. soup spoon and replacement knife and fork). I had to ask not once, but twice. The second time I received a look of incredulousness as if I didn't know what I was talking about. Our waitress was not particularly friendly. She was less than impressive, at least with us. She appeared to be catering to other patrons just fine. It was actually the bus boys who had any redeeming qualities. They were quick to refill our glasses of water and clear the table. \n\nOverall, we enjoyed our evening there, albeit it was somewhat marred by the poor service from our waitress. Decided to take Dad to the Gladly for a special father's day dinner, and because I had been dreaming about that amazing chopped salad. We split the salad, which was as delicious as I remembered. He got the special steak. I got the short ribs. Both were incredible. The only thing I'd change about this restaurant is to tone down the noise level. I would definitely go back. Terrible service at the bar, but the food was very good. Love the menu at The Gladly; whether you are stopping by for a small bite and drinks or you are celebrating a special occasion and having dinner, The Gladly has it all. Loved this restaurant. Great creative menu and food very well prepared. Our waitress was fabulous! First time here and came in with high expectations after hearing the chef is nominated for James Beard award. \nService was outstanding. Menu looked interesting with lots of options. However, it must've been an off night for the kitchen. A few of the items seemed bland and underseasoned and my entrÃ©e which was the braised chicken was unbelievably dry. Will probably come back to try it again. Third time here and this place has become one of my favorite places. Service is outstanding, food is outstanding with a great bar! The Gladly is a great place to eat and have a great cocktail or 3. They rotate the menu, always tons of choice and will Gladly alter your dish as you wish. The brussell sprouts and grits are heaven.\n\nEnough cannot be said about how great their server Cat is! She ALWAYS does a wonderful job, makes you feel at home and never ever steers you wrong. She is truly the best service staff in town! She is amazing and no, I'm not a family member either, just a VERY happy customer. Let her pick your drink, you won't be disappointed at all. The atmosphere was Upscale Chic. There was Eclectic music, a lively bar, and a beautiful patio. It had that downtown San Francisco Vibe. The cocktails were original. There were several options on the menu that I had never been acquainted with. I would say their drinks were old school styled with a modern twist. I personally enjoyed the Bay City Shandy, another recommendation by Kat. It was our chosen Drink for the Night. This drink was the perfect blend of sour with just the right amount of kick. I love my drinks to be fresh and not contain a lot of sugar and this drink definitely exceeded my expectations. It normally comes on the rocks, but I chose to have it served martini style. I chose the chopped salad, scallops and then the banana bread pudding for dessert. All 3 were phenomenal. Several of us had the chopped salad and we all fell in love with it. The scallops were cooked perfectly, they were tender and flavorful. The banana bread pudding made the perfect ending to our meal. It wasnât too heavy, and not too sweet yet simply delicious. \nI definitely recommend this place if youâre looking to experience a cool, relaxed environment with beautiful people and excellent food! If you are a whiskey drinker this is the place for you! I love the margaritas, though! You can't go wrong with any of their specialty drinks ðThe food is tasty, the atmosphere is classy and the service is always good!! Love this place. The only issue I had this time was it was very warm inside. My parents recently moved into the area and treated us to dinner at The Gladly. The staff were knowledgable, friendly, polite, happy, and efficient. Our server was Kat and she was lovely to my parents and very responsive no matter what we requested. Curtis was the Whiskey guru and my husband and I had a fabulous time trying new whiskeys and scotches we had never heard of before. The list is quite extensive. \nThe food was good- esp the chicken liver pate, the smoked mozzarella fondue with pork chunks and the salad. My mother loved her moist frog leg appetizer, which was just crispy but not overly breaded. The short ribs were a bit dry and the duck meatloaf was a bit overcooked and flavorless. My husband's wyagu burger was done to perfection, however. The brussels sprouts were divine. We did not indulge in desserts, but they looked wonderful. \nThe menu changes quarterly, so we will be back. Very noisy, but then it was the same when it was Ruth's Chris. The appetizers were good. The scallops were better. The Duck Meatloaf was just awful. How could it be dry as sawdust, no taste, with a hint of foie gras and a ton of butter...but it was. For dessert, hard as a rock streusel. Will not return for sure. Then Have More Cocktails!\n\nDined here three times and also hosted a catered luncheon in their private room. Both the bar and kitchen have some talented people creating great food and drink. The bar's menu of cocktails and selection of spirits is 'too much' in a good way and the restaurant's offerings of entree's and burgers matches up very nicely. An added bonus is the chopped salad from sister restaurant, Citizen's Public House. Has there ever been a better use of freeze dried corn?\n\nFor anyone considering a moderate sized event, perhaps up to 60 people, the private room, with the availability of ti's own bar and excellent projection video system is a great venue for club events and presentations. Excellent food. The halibut was delicious. Great drinks too! One of the best restaurants we've been to in the Phoenix area. Food & service were top notch. The chopped salad is a must try. We'll be back soon! Christmas Eve dinner was just what we wanted. Great energy, lively, but not loud, crowd.\nFabulous service and happy employees. Had the fondue, salad and roasted veggies-yummy. My husband had the filet - perfectly cooked. Tim, our wait person, was exceptional. I took a group of 5 here for a business celebration, and we all loved it! Very creative menu with lots of delicious options. We sampled from the cocktail menu and enjoyed our selections. The favorite was the Thai Margarita - loved the spicy salt rim! Everything was perfectly prepared and nicely presented. The only exception was the burrata, which just wasn't a creative or appetizing presentation, but tasted absolutely wonderful (we loved the roasted tomatoes and green romesco sauce with the burrata). Even the desserts were great. Highly recommend and will definitely go back when in the area. I drove around for almost 25 minutes searching for a parking spot. Finally paid $5 to park three blocks away. I was hot, sweaty & late when I finally arrived. The luncheon salad was good & nice presentation but I won't go again because the lack of parking soured the experience. My friend drove around too but got lucky as she saw someone leaving and was able to snag the spot. I was told parking isn't always a problem. This was a business meeting, it was just the right atmosphere to discuss business, without being too noisy. Cocktails and food were exceptional! The Gladly is incredible--everything from all the cocktails to the scotches to the wines and beers. What an incredible bar!! The food is great and unique, but always the start is the 'Chopped Salad,' but there are so many other wonderful things on the menu. We had only eaten there once before, and my food then was STELLAR. My food this time was rather a letdown..(I had the Chiliquilles (misspelled). My husband had the 'Brisket and gravy' and he said it was just ok, but he was also somewhat disappointed in the dish overall. It wasn't that the food was BAD, it was just that we would never order THOSE items again. My Mimosa was delicious, as it had been the first time, and I wished I could have remembered what dish I had eaten the first time we came. Highly disappointed especially after reading all the high Yelp reviews. Food is average- service was slow and inattentive. Management stood around adding up dollar signs in their head instead of getting in and assisting the waiter's slow service. Advertised as a 'unique' dining experience---which it was not unique- unless they deem unique as poor service and mediocre food. Gladly is unique and delicious; there's really no need to say more except that you'll love it. Oh and make sure that you order the ice ball, an amazing feat of science that turns a cube of ice into a large round ball of impurity free ice for your drink, done at your table top. Not to mention part of the sale goes to charity. Tremendous scotch, whiskey, rum and rye list. Really liked the 'ice ball' available for $3, 'made' at tableside. I had my go-to favorite, which is their salmon chopped salad, while my business guest enjoyed the scallops. We sampled several scotches, had a great evening! Great food. The chopped salad is a signature dish. We're pescatarian. The menu changes over time, but we've had the seabass and loved the preparation. We were not so impressed with the mac-and-cheese. It could have used more spice. The seared tuna plate is a hit, as is the charred octopus. Drinks are creatively prepared by wonderful mixologists. Ask for Tim to be your server. He's fantastic...enthusiastic, knowledgeable and joy to interact with. Tim gets 5 stars in my book. Food was excellent;especially at Restaurant Week's prices! The Brussel sprouts and grits are amazing. We went for an early dinner on Sunday and had a wonderful time. We so enjoyed the appetizers that we never made it to the entree's. The cocktails are interesting novel and well integrated - very thoughtful constructions. This is a fun place in the evenings - for off hours it is even better! Ice Sphere for cocktail was awesome.\nChop salad was excellent.\nbrussel sprout app was good.\nDuck meatloaf was very dry. The rest of the garnish with Duck meatloaf entree was very tasty.\nOur server Tim was very nice, however he did smell very strong of cigarette smoke and that made our food experience a little underwhelming. The churro waffles are amazing. Unfortunately we ordered that second because two of the four of us didn't enjoy our original order. Service was good, prices are fair with some standout deals. I had been to The Gladly several times & always had a great meal. Asked a few guests to join me for Restaurant Week. We requested a quiet table. Our hostess, Allie, went above & beyond the call of duty to find us a table which was just perfect! We were so impressed with her efforts. She was friendly & welcoming & set the tone for a great evening! The food was fantastic & plentiful! Try the short ribs & chopped salad. Both exceeded our expectations. Our waitress, Kiallie, was responsive to our every need. Her service was attentive without being overbearing. We enjoyed every aspect of our meal - the food was outstanding & a great value, the service was fantastic! In short, we felt the love..... Kudos to the chef/owner for great food & a spectacular evening! And special thanks to Allie & Kiallie for enhancing our dining experience. Food was good and staff was friendly. The food was amazing along with some of their specialty drinks. We had to order more as everyone wanted to taste the drinks. Each course of the meal was perfectly balanced. We were celebrating both my daughters birthday and engagement! The Gladly was the perfect place to do it. Our server was attentive, knowledgable and extremely nice. She even brought out glasses of champagne (on the house!) to celebrate! The supportive staff was fantastic and attentive as well never letter our water glasses go low or plates linger too long. We highly recommend to have them melt a ice ball at the table - very cool and a must to pair with their extensive Whisky/Burbon list. We will most certainly keep The Gladly in mind for our next celebratory dinner! This was our first time here but it definitely won't be our last. The service was excellent and the food was truly amazing. A little pricey for us for everyday dining but will definitely be on our list for special occasions. The food and drinks were decent. The noise level was not the 'energetic' feel that is advertised, but it was loud and difficult to converse with other members of the party. Would go back for an intimate evening outside to try the place another time. We came for restaurant week and had a wonderful meal at a great value. We definitely will return soon. The ice balls are a fun feature! The food was absolutely incredible. This was our first time and we will undoubtedly go again. Thank you to restaurant week for introducing us to this amazing restaurant we never knew existed! I struggle with this review because we really did have a pleasant experience but there were some things I thought needed some addressing. \n\nPros: First off, the service here is top notch, really. Everyone from the host/hostesses to the server to the busser were on point and friendly. Wacky hair server tim was really awesome, and really helped our dining experience. Drinks were good, although the maple syrup in the Manhatten made it a smidgin too sweet for my tastes. They also make absolutely perfect ice balls from scratch at the table for $3. Seems like a nickel and diming but at least they allegedly give $1 of each cube to charity. The chopped salad was really yummy, the spotlight being the smoked salmon. Without it, the salad would lack. For dessert, I swooned for the bourbon apple pudding; my husband ordered the chocolate mousse I believe and it was okay. Apparently they make their own ice cream and the mint and insanely good.\n\nThe Cons:\nThe entrees were both good, for sure, but in my opinion lacked seasoning. The pork chop was good alone, but when paired with the accompaniments was virtually tasteless. The duck meatloaf was super tender and the 'grits' (I don't think they were grits but were very similar) were yummy but I thought the sauce was kind of lacking. Again, thought maybe there weren't enough herbs in the meatloaf. I hate salt but love pepper. Thought it very odd there was no shaker on the table.\n\nOverall the dinner was pleasing but for the price ($150 w/drinks at the $33pp restaurant week) I expected a smidgin more. I thought the price was fair for scottsdale but the ambience just wasn't matching. I might come again and I'm glad I tried it. Just needs a little extra for me. The chopped salad was wonderful as was the bread pudding for dessert, yummy. We always have a great experience at The Gladly, and this dinner was no exception! We were there to celebrate my parents 59th Anniversary and from the hostess's greeting to our server's (Kat?) enthusiasm and the wonderful cuisine, everything was fantastic. My parents were definitely 'wowed'!! Unique twists with every menu item. I had the brisket on WHIPPED masa...I repeat whipped! Unbelievably delicious! My wife and mother-in-law had the chopped salad...great! Service was outstanding...vivacious, knowledgeable, perfectly timed! Love this place...just wish I lived closer!! My husband and I took our son for dinner for his 25th Birthday. Our party of four ordered different entrees - which was nice because we all changed our mind several times and we got to see what we almost ordered. We were all happy with what we ordered. Great food. I really liked the personal touch when our server gave our son an ice cream scoop plus a cookie. He enjoyed that. Recently enjoyed a delicious meal on the Gladly's outdoor patio. My friend and I were seated, but then waited 20 minutes with no attention from server. I finally approached the hostess to inquire who our server was and would they please come take our drink order while we waited for third person in our party to arrive. Server arrived shortly thereafter, apologized profusely and comped our first round of drinks to apologize for the delay. Fondue appetizer and mac & cheese were both delicious - more cheese please! Good wine selection. I had scallops as my entree and they were tender, well-seasoned...a great dish. I'd recommend The Gladly despite our bumping start with delayed service. Will return for future meals. The food and atmosphere were great! Our server was so friendly and genuine. I would absolutely go back, maybe try their happy hour. Some really tasty cocktails and unusual offerings. The food was amazing! We ordered appetizers, small plates, multiple entrees, and a dessert. Everything was perfectly cooked and beautifuly plated. The service was wonderful--our server was friendly, attentive and knowledgeable. The drinks were pricey but tasty, and the ice ball is a must. I am not a huge eater, but I skipped lunch in anticipation of dining out. After sharing two appetizers between four people and eating my entree, I was still hungry. If I go again, I'll get a salad, too. For these prices, though, I don't expect to leave hungry. I wish the portions were bigger. Still don't understand why anyone would name a restaurant The Gladly, but enjoyed the food. Chopped salad from Cowboy Chic still excellent after all these years. ('Cowboy Chic' -- now there's a great name for a restaurant.) Service was outstanding; attentive, genuine, and friendly without trying too hard. We've dined at The Gladly on many occasions, but I have to say this time was bad from start to finish. We ordered the Chopped Salad which usually never disappoints, but for some reason they had very little smoked salmon in it. What normally is a wow salad was just meh this time. Next onto the entrees, my husband had the short ribs and I had the pork chop. My husband thought the meat was good and tender, but lacked flavor. My pork chop was completely bland. It almost seemed like the kitchen ran out of salt and pepper since everything seemed REALLY under seasoned. The waitress was nice and offered us a free desert which we choose the chocolate torte. Unfortunately, that was the cap to the evening. The torte was overly dry and was served with freezer burned ice cream. I really hate to write such a bad review since I'm hopeful this was just an off night for them and not the new normal. I think it will be awhile before we try them again. Alway a great experience when I'm there. Amazing service and too notch food and drinks. The Brussels Sprouts appetizer was fabulous as well as the Duck Meatloaf (Decadent). Tip: if you love whiskey, order it with an ice ball. It is worth the extra few dollars. I won't say why. I will let it be a surprise.\n\nThis is the second time that my husband and I have had an excellent experience not only in the food but the staff's detailed knowledge of wine, whiskey and how food is prepared. It makes the dining experience that much more pleasurable. I love this place for the drinks. They have a lot of whiskey options and also great drinks that my wife enjoyed. The service was excellent. The food is average. I had the Duck Meatloaf that was highly recommended but I was not very impressed with it. I guess I should have realized it was meatloaf and shouldn't order that at a restaurant but I wanted to go with the recommendation. The chopped salad is really good and that is something we get all the time. Overall this is one of my favorite places but the food options could be better. Especially for the price. The service was on-point and the food was amazing. We will definitely be back! Wonderful food, and the drinks are splendid. The ice sphere is well worth your time. The service is also terrific. Highly recommended! we had the special, a trout, that was AMAZING. sat outside at night and the patio is beautiful. our server was very attentive and helpful. drinks were delicious, lots of options! had the banana cream jar dessert which was the highlight! We dine here often and are never disappointed. My mom & I came here for lunch last week specifically because we were craving their delicious & 'famous' chopped salad. It is always consistently yummy! And they can prepare it with chicken in place of the salmon if you prefer. The presentation is beautiful & colorful with each ingredient side by side. In addition, I always order a side of French fries with thousand island dressing to 'dip' my fries in. They were actually out of the dressing on this particular day, but our server, I believe her name is Kayli, was so kind that she had the kitchen make some for me:) She is an excellent server...always friendly, & not only does she remember me as a guest when I come in, but she remembers what I order & how I order it...which is remarkable to me! I can't wait to go back again! Took my pregnant wife here for our anniversary. They made her a mock tail she really enjoyed. Waiter was really helpful with recommendations on food and drink options without being pushy. Food was amazing. Atmosphere was nice. It was quiet being a Tuesday but it seemed like it could get noisy when busy. Will go here again!! Came here for Valentine's Day and loved every part of it. Our server was so so nice and caring. Our three course meal was beyond tasteful. The atmosphere was brilliant. And how about that Chopped Salad?! It was my favorite part of the meal. Definitely going to go back to grab the Chopped Salad for takeout. Absolutely no complaints. I highly recommend dining here for a nice get-to-gether with the gals or a nice date night with your hubby. Visiting from Seattle. Went for Valentine's Special dinner and sat outside. Meal was fantastic. Good service. Everything was amazing! Will definitely go back again soon! We had a delicious meal for a decent value. Enjoyed every bite! Great ambiance and food. Pork chop was excellent as were the short ribs; burrata app was really good as well. The tables are way too close together to have any privacy with your own party. I could hear the entire 1hr conversation of the neighboring table. Did the Gladly for Valentines night and it didn't disappoint. Had the Sea Bass and Scallops dinners. Both were big portions and the polenta and mashed potatoes sides were really good. We love the variety of single malt scotches and never tire of the ice ball presentation. Service is spot on and prices are reasonable. The Gladly serves great cocktails, Cowboy Ciao's Original Chopped Salad, and if you are fortunate enough to sit in Cat's section, the best service in town. I would recommend Gladfly for 2 primary reasons; nice twist on traditional faire with enough variety for everyone and the largest collection of English, Canadian, and American whiskeys/scotch I have come across in my travels. The give huge portions so order accordingly. I visited the gladly for the first time, and I was very impressed! The waitress was funny and very courteous, and the food was absolutely incredible! Every dish tasted so fresh and full of flavor! The chopped salad was a big hit at my table. The Gladly has a huge drink selection and the drinks my table had were all delicious and unique. The atmosphere was very relaxed and modern. and theremember was barely any noise level. I had no complaints whatsoever after my visit. Thank you to The Gladly! A wonderful Christmas Eve dinner at the Gladley. Our waiter was charming, prompt and friendly. The dining room is open and modern but noise was not as loud as one might expect . The waiter recommended the duck meatloaf to the hubby which he loved. We enjoyed the showmanship of the ice balls in the cocktails. Delicious Scallops but would skip the seabass next time. A delightful evening was had by all and we would definitely return again. if you like scotch...check out this place and their famous ice balls!! no joke!! Great atmosphere. Very snotty waitress. When asked how steak salad was she said excellent if u like blue cheese. Ordered it. NO blue cheese. When I asked where blue cheese was she said ' oh it's just blue cheese dressing'. Very disappointing. Also was supposed to have cherries. There were maybe 3 small PARTS of cherries. Waitress didn't acknowledge our concerns at all. What happened to customer service?? Never returning and not recommending it. I took a client to dinner here and everything was fantastic! We enjoyed the manhattans before dinner, appetizers were great (spring rolls and burrata), everyone really enjoyed their meals - duck meatloaf, short ribs and the pork chop! We also enjoyed the desserts. I love The Gladly. I invite everyone I know to meet me there and I'm thrilled when they take me up on it. Expansive selection of whiskey and bourbon that I'm still working my way through. Delightful cocktails. Attention to detail. The duck meatloaf is surprisingly delicious. If you just want a cocktail and a snack you can't go wrong with pretty much any drink and some Super Yummy Nuts, which are smokey, sweet, complex, intense and so addictive they should probably be illegal. Still working on trying all the menu items. Chopped salad is lovely. So far everything I've had I've loved. Excellent service. I stumbled upon the Glady when I was looking for a place to have my birthday dinner. My evening was nothing short of delightful! Great staff, delicious food, and one of the most expansive whiskey lists I have come across in a long time. Thank you for providing such excellent service! Went to the gladly for a date and it was an excellent choice. I am a huge fan of their sister restaurant so I've been wanting to try Gladly for a while. The food was delicious (duck meatloaf) and the whisky/bourbon list was top notch for Arizona (originally from Kentucky). The girl bartender was very knowledgeable and not bad on the eyes either. She knew more about bourbon than I did, and I grew up in Kentucky!! Recommend as a must try in Phoenix! I could walk to this restaurant it's so close to my home, but tend to go there for lunch during the weekdays, which is nowhere near my office. I meet friends here and am always amazed at how quickly 2-3 hours goes by here. The food is always good, the service is wonderful and when the weather is nice, the outdoor seating is the best. We visiting The Gladly for the first time for dinner, and immiately noticed how loud the place was. If you are after a quiet dinner where having a conversation is realistic, stay away from this place.\nThe food was very good for the most part, except my short ribs dinner. I am a huge short rib fan, and have had some fabulous short rib dinners around Phoenix. However, the short ribs at The Gladly were disappointing. Very fatty. The salad however was wonderful. Last minute Anniversary plans! It was great!! Delicious! I am a self proclaimed foodie and I dine out 4-5 times a week in various cities, but I have to say that The Gladly has been the best, by far, of all restaurants I've visited in a long time. The chef creates imaginative and delectable dishes that change seasonally and the service was better than most very high end restaurants I've been to. They are friendly, and knowledgeable, always willing to give a suggestion and even a personal opinion on a dish, but most of all, willing to please you at any turn. I enjoyed it so much, I went back two more times in the same week to be sure it wasn't just a fluke. Try the short ribs and the scallops...YUM!\nWell Done Gladly!!! Our server was always there, ready with anything and lovely. When I inquired about something she immediately checked.\nThe whiskey list is huge, and the bartender made smart drinks and quite knowledgeable.\nThe chopped salad is amazing - I would go back for that anytime.\nThe duck meatloaf was too bitter, they had not treated it well with spices - so it was a bit gamey. \nThe Hillbilly eggroll was under seasoned.\nThe chicken wings were ok- nothing special. Choose The Gladly based on Open Table reviews- we were certainly not disappointed. Service was professional and prompt. Very helpful waitstaff. Excellent fondue app; delicious chopped salad; and outstanding sauce with scallop entree. Highly recommend. I've had varied experiences from multiple restaurants along the Camelback corridor but it tends to be a moderate experience with pretentious overpriced meals.\n\nWhere as the Gladly isn't inexpensive, the offerings were vast and the food was phenomenal! \n\nThe service was prompt, friendly and informative. \n\nThe drink menu was fun. If you're a whiskey drinker or want to try something new, this is the place for you.\n\nI look forward to my second visit. Everything was wonderful except our server. All of the other service was wonderful including bussers and food runners. Have been several times for brunch and cocktails but recently went for dinner during September Restaurant Week. Although the $33 value was very good, it took three times for the scallops to be prepared to my liking. The server did not express the chef's recommended serving temperature and it was frustrating. Will return to give it another try - hope my recent experience was just a temporary glitch. Easy access and parking, good location, good ambiance, good food, but just to loud. Food was delicious! Service was very good and attentive. Will be returning! Our service was not good and it spoiled the experience. She missed our appetizer and got one of the meals wrong. We asked for avocado on the salad and got chicken. Met a friend for lunch. The restaurant gradually filled with a nice buzz. We shared the grits and brussel sprouts as a starter which are not to be missed! The roasted brussel sprouts are nestled in a fabulous grits preparations that must include a great deal of cheese. Divine! We also shared the steak salad. Excellent meat in a bed of greens with cherries and light dressing. To my surprise we were gifted with dessert. It was a tart filled with dense dark chocolate on salted caramel. Topped with chocolate ice cream. Definitely a death by chocolate experience. Excellent service--friendly and efficient. Our server Kat was so amazing. Very knowledgeable and attentive. She is such an authentic and real person. Made our evening so memorable. Unique menu with lots of options. Food was outstanding! Very accomodating and flexible with reservation. First time there but definitely coming back. The food there is great. The drinks even better. They have an ice ball shaping device that creates the most perfect clear ice ball that makes drinking Manhattans a treat. Service was also prompt and friendly. If you haven't been, you should. You will not be disappointed here. Everything from the service to the cocktails to the entrÃ©es was phenomenal. If having a full meal including appetizers cocktails and entrÃ©es expect to pay $70 for diner. Try the old-fashioned here with the table side ice severe which will last through at least three cocktails and makes whatever beverage you're having quite fun. The dining room is not too large and is two-tiered which makes things interesting. The candlelight and soft lighting along with lofty ceilings provide a very open atmosphere perfect for either romantic dinner or celebrating in their outdoor patio which would be perfect from October through March/April. Both the chop salad and fillet we're done very well and had excellent flavor. I will definitely be returning to explore the rest of their menu including the extensive whiskey list which is difficult to find at some upscale dining. I had fatty and chewy shortribs that had the flavor of straight blasamic vinegar. No one in my party enjoyed their dinner and we had to repeatedly flag down the waiter for assistance. We have been to The Gladly on a variety of occasions. It seems each time is better than the time before. Everything about this restaurant experience is delightful from the greeting to the goodbye.\n\nEveryone works together at The Gladly and that makes it enjoyable every visit. The staff are all knowledgeable and offer fantastic suggestions! Anyone who decides to give them a try will not regret it. The flavors and presentation of the food is incredible. The atmosphere is quite comfortable. You can dress casually or dress up and you will be treated like royalty. \n\nAs always, Gladly, we will be back and we will continue to tell as many people as we can that they should do the same! From start to finish a great dinning experience. The cocktails are very different from most but very enjoyable. The duck meatloaf was fantastic. Our server was so super!!! Excellente service. Great place to go with friends and/or after work. Went to the Gladly for date night with the hubs and we had a nice time. The food was phenomenal. Best scallops in the valley and the hubs Wagyu burger was out of this world. Would be a great place for a group of women to get together for dinner/drinks and gossip. Not sure I'd go back for another date night though. It was a little noisy for lunch time because the music was so loud. But the food was amazing as always! Fabulous food, ambiance, service, and drinks. I've eaten there there three times...dinner, lunch and brunch and each time has been the same...wonderful. Add to that some of the best cocktails in Phoenix and it only gets better! Very reasonably priced considering the quality of the food and the service! As a fan of the Gladly's sister restaurant, CPH, we had high expectations for the Gladly - and they were met! Food, drinks and service was amazing! My only concern - and I've seen this from others - was that it was a bit too noisy. The musician playing was great (had a great selection), but the volume was a bit too loud and made it difficult to carry on a conversation within our group. Otherwise, like CPH, everything was well worth it! Starting going to this establishment last year. It is still a great find. The service is fabulous, which I feel is very important. The food has maintained it's consistency and is very good. Brunch on Sunday is a must. It gets busier each time I'm there...a good thing...more people discovering this gem!! We had a fantastic date night and so appreciated the fun and attentive service. The fondue and chopped salad were fantastic as were the in house aged drinks. You haven't lived until you've had a server make a cocktail ice ball out of sashimi-grade ice right before your eyes. The cocktails aren't too shabby either. The chopped salad has a nice balance of texture and flavor. The duck meatloaf is a huge portion and ridiculously moist. The bread pudding is also incredible. All in all a great meal. I was in Phoenix on business with a colleague and we enjoyed a fabulous late dinner at The Gladly midweek. We wished we could have hit the bar during happy hour but we work required us to settle for 'just' an outstanding dinner. The food was out of this world and how The Gladly can make a plain salad, not plain and exceptionally good, still eludes me. All of the food was amazing -- taste, presentation, and amount were perfect. The service was also outstanding. An all time rarity - I cannot think of any constructive criticism. Loved it! Another great restaurant from these guys. Love the concept and the food as always is spot on done well. My husband and I were visiting the Phoenix area and a friend suggested we try The Gladly. We are from Richmond, VA where the restaurant scene has exploded over the last several years and it is a great place for foodies to live and eat. Thus, we have grown to be rather picky about food, service, etc. over time. When we arrived at The Gladly, we were given an unremarkable table but that's where the unremarkable ended. Our server, Kat, brought our first cocktail with an ice ball maker in tow (which took a block of ice and turned it into an ice sphere in a matter of minutes) and that was the beginning of our wonderful evening. The appetizer, small plate and entrees were all delicious. Kat made wonderfully helpful comments and suggestions the entire evening. Plus, between the staff and the bottle on our table, our water glasses were never empty (which is important if driving home). Our experience at The Gladly was...the best ever. I'm sad we do not live closer! We went to The Gladly to surprise my sister for her birthday and had an awesome time! \nOur server was absolutely wonderful and helped to ensure we had the very best experience possible. I feel bad to have forgotten her name, but I was anxiously awaiting my sister's arrival (we were surprising her, she had no idea). The server was blonde, very high energy, and funny, so if you see her, you're in good hands! \nShe waited patiently about 30 minutes before my sister even got there and she helped to plan out a special birthday treat for her (chocolate caramel tart â AMAZING). \nWe got the chopped salad (INCREDIBLE, must get!! ), brussel sprouts, mac & cheese, scallops, and burgers. \nAll of the food was phenomenal! If you like Bleu Cheese, then you will definitely like the burger because it has a rich bleu cheese spread on it. \nThe scallops are always cooked to perfection!\n\nOverall, it was a great experience because our serve was incredible! She made for a wonderful celebration!! WONDERFUL food, and a great spot for casual or business lunches! We really enjoyed the laid back and comfortable feeling of this place. The service was outstanding and we really enjoyed sharing a variety of small plates. We really enjoyed the drink special with the frozen clear ice sphere!!! Added an element of fun to the entire evening. Would highly recommend to anyone who wants a great dining experience, with good food and adult beverages!! Service was great with great flow. All of our dinner courses were interesting and outstanding. The bourbon selection is amazing. The ice ball presentation with my rye made my night. Patio closed because of rain and we were seated in on a balcony that was referred to as the Library but more like a banquet hall in noise level and ambiance. Menu was interesting but food disappointing. Steelhead salmon overcooked, tuna had fishy aroma. Service was mixed-our guests had difficulty placing an order for drinks. All 'n all there are other restaurants, in the Scottsdale/Phoenix area, that do a better job of delivering a pleasant innovative dining experience. A difficult menu to order from. Wasn't impressed with the Wagyu burger and fries , brussel sprouts were just OK. The chopped salad was great as always. The wine by the glass was too pricey . The brussel sprouts were to die for - you can't go wrong with truffled anything! Our group also enjoyed the chopped salad, short ribs, filet steak, and mozarella. The only 'miss' was the field greens salad, which was WAY overdressed - restraint, people! Nathan our server made the evening special. The food was very good and the presentation was good also. I will go back and bring additional friends. Great little place that boasts a very unique menu, incredibly kind and accommodating staff and just overall awesomeness! Very impressed! The wait staff was very informative and gracious. The food was of great quality, the butternut squash soup was even hot!. The wait staff appeared to anticipate needs related to drinks. A very enjoyable dinner. Thank you for having staff who knows the 'finer points' of customer service. My sister and I had dinner here while we were on vacation. A local friend recommended the restaurant. It took a waiter 10 minutes to greet us, I actually had to ask for one. They did comp us brussel sprouts for the wait. The food was pretty delicious although I'm not a great judge. I took 4 friends to the Gladly and we had a great time. The food was delicious and table side prep was a great throwback. I had the scallops which were perfectly cooked. Also had a Manhattan with one huge ice cube. Excellent. My only criticism was the noise level as 2 of my guests were older. We had the house salad, Mac and Cheese, scallops and seared tuna. It was all great, with our least favorite being the tuna (just personal taste, lacked in punch/gal or compared to the rest of the dishes) our favorite was the house salad and scallops. \n\nThe scene was cool, lots of different types of people which make the place feel approachable. Not a huge selection of different items, but the ones they have are quite unique and tasted great. The space is light flooded and when we brunched there on Sunday some live music was being played, that was really sweet. Weâve been to The Gladly several times and once again it delivered wonderful, creative food and fantastic service. We stopped in before heading to a play downtown. The Chopped Salad was creative and had a wonderful array of tastes and textures that makes it unique. We each had a featured daily appetizer. One had brisket from Little Miss BBQ, with noodles, broth, and a poached egg, and the other was a quesadilla with braised lamb prepared with a couple of different chilies and served with a light sour cream. Both were fantastic. Our server Phillip was wonderful, very friendly, knowledgeable about the drinks and menu, and very attentive. The Gladly is a canât miss night out! We went to The Gladly for lunch to celebrate a special occasion! Sitting outside was a lovely experience and our waitress was excellent! We especially enjoyed the chopped chicken salad...being tossed at our table and a great presentation besides being delicious! Loved the brunch items option on the menu. We definitely will try it again! Party of four...all food was very good. Service was very slow & reason given wasn't\ncredible. At least worth a laugh. Probably will be better next time. The Gladly is so classy and hip. Great for romantic dinners or casual happy hours with coworkers! I send everyone I know there. The food is incredible and the service is great. It's such a beautifully designed restaurant as well. The Gladly was a nice surprise as I had not heard of the restaurant prior to making the reservations. Although they had a limited menu due to the special Valentine's evening, each course was flavorful and the ambience, although a bit loud, still offered me an opportunity to have conversation with my wife throughout dinner without having to yell across the table. One 'downer' was that we did feel a bit rushed as we hadn't even finished our appetizers when the entrees were being presented. Didn't want the food to get cold so we had to rush through. I might be able to understand a bit of the restaurant was full but it was not. However, that could be overlooked and it was a better experience than waiting too long for the food to arrive. Finely an adult restaurant that caters to those with a more sophisticated palate! Love the ability to actually have an appetizer before an entree and be able to enjoy both! Wonderful sophisticated flavors. Love the seafood vs meat selections. Not everyone can eat or be in a room with shellfish. Love the drink menu â real cocktails for a more developed palate. Will be back! \n\nGroup of 4 ordered: Pistachio Chicken Liver Pate, Hillbilly Egg Roll, Noble Bread, Kale & Quinoa Salad, The Original Chopped Salad, Lamb Riblettes, Wagyu Burger, Grilled Filet Mignon. We ordered martinis and the ice ball with several different scotches. I had been to The Gladly only one time before, during lunch. This time I made a dinner reservation and requested a more intimate setting since it was our first night out after baby. Upon arrival the hostesses were all very friendly and helpful - they paid attention to the note I had made via OpenTable and requested we sit outside for a more intimate setting. The night couldn't have more beautiful and perfect! The atmosphere, ambiance, food AND our server were absolutely amazing! We will DEFINITELY be back there again. My husband even said he will now suggest The Gladly for his many client meetings. The food was delicious. Everything from salads and small plates to main dish. And that chocolate tart we shared was perfect end to meal. Service was quite good, even for a busy nite. Food was acceptable, albeit overpriced. Special occasion (Valentines) PF menu was not a very good deal. Valentine's Day was our first visit. The special menu had a reasonable variety of starters and mains. We enjoyed the pillowy golden scallops and a surprisingly good duck meatloaf with sweet dark cherries. The wine list is thorough but thankfully not a multi-page book. With one of our cocktails we ordered a pressed ice ball. You have to try one. The mesmerizing on-table preparation alone is worth the $3 extra bucks, but aside from looking cool its geometry actually helps cool the drink better.\n\nService was as good as the food. Not a table in the restaurant was empty, yet every server including ours seemed relaxed. This made our dinner more relaxed, too. Just after sunset, the lights outside the restaurant came on which also indirectly lit the inside. The entire experience was a great way to start the night. This place gives you a warm welcome right from the start. Fantastic liquor selection and superb dishes made this place an easy 5 stars for my date and I. We always enjoy our experince at The Gladly... the people, service, food and the ambiance are all excellent. We really enjoyed sitting at our favorite table. Thanks Tim! We went there for Valentines Day. It was a truly enjoyable experience in every aspect. The Gladly's ambiance and excellent service made the occasion extra special. Wish we would have tried it sooner! Had a great luch on Sunday ! Wait staff was excellent and the food delish! The chopped salad and the Brussels sprout salad were fantastic! We all shared a sticky bun which was excellent!\nWould definitely go again !\nThe sorbet mimosa is a must! Ordered a chicken breast it was pretty tough and when the waiter took it back to get me something else I waited 30 minutes for the replacement- no manager came to check in - no sorry from the waiter - more like it was the expectation... Won't be back! This was my first time at The Gladly and I walked in really wanting to like it. I left feeling let down and disappointed. Most of the let-down can be attributed to a completely inexperienced (or very poorly trained) server, but a good share of the responsibility lies with the management as well. Someone - anyone - should be paying attention to server training! About the only thing our server got right was comping my barely warm soup.\n\nWith so many really good dining options out there, I won't be returning to The Gladly anytime soon. Went to the Gladly for a friend's birthday. Had not been in the space since it was a Ruth's Chris. It has been nicely updated and definitely more contemporary than its predecessor. The staff really made our experience. The male host went out of his way to get our table set up (we were early). The bartender was fun and engaging and the highlight was our waitress whom one of our guest simply called, 'pretty girl.' She was extremely knowledgeable and fun and took exceptional care of us.\n\nThe food was very nicely prepared. A new take on some traditional items and more than enough interest for foodies - from pates to Cobia fish - everyone enjoyed their meal.\n\nWell done Gladly! We live in the Biltmore/Arcadia neighborhood and were looking for a new restaurant to try for our anniversary celebration. We've driven by the Gladly several times, and after reading the reviews of it, we decided to go there. We loved every minute we were there starting with our drinks--my husband had the Gladly Manhattan, and I had the Conflagration Nation. It was so amazing. The Chopped Salad is something I will crave until the next time I go. Our entrees were wonderful. I had the Chimichurri Chicken, and my husband had the Loch Etive Steelhead. For dessert, we shared the banana pudding and drank some tawny port. We can't wait to go back. Fantastic server, super friendly staff in general. Ice ball always entertains the crowd and is fun to have in one's cocktail as well. Food never disappoints! Very trendy spot with a large following. Nice drink menu. We had an excellent anniversary dinner at The Gladly. We opted for an early reservation just after the place opened, and we decided on a collection of appetizers and small plates. Our server, Chris, was kind, fun and knowledgeable. He suggested a few of his favorite dishes (the original chopped salad being one of them-- phenomenal!) and also recommended our cocktails. A highlight of the meal was the presentation Chris made of making our ice-ball for my second drink (bourbon), as well as the pistachio-chicken liver patÃ© appetizer and the seared spicy tuna. We will definitely be back, thanks to the stellar service, affordable prices and thoughtful, creative and delicious fare. Thank you! Enjoyed this restaurant, ambiance, food and service. Found it exceptionally loud! We love The Gladly! Whether inside or out, table or bar, love the atmosphere and the friendliness of all the servers. Brian, behind the bar is our favorite! He knows his beverages..... Food is always good and reliable. Love to share with out of town guests and a local favorite with friends. From the Bloody Mary to chop salad to banana jar dessert, enjoyed every bite. This was our second time at The Gladly and both times it was outstanding. The service is very warm and friendly while being knowledgeable and non intrusive. Great atmosphere with a high energy level but the real reason to go is the food. It is just wonderful. If the steelhead trout is available make sure you order it, it is simply fantastic. Our experience was phenomenally memorable. Kat took care of us and as always made the evening a pleasure. The prix fixe NYE meal was incredibly diverse and had our favorites on the menu. From the steelhead to the filet, chopped salad to pate, and Tracy Dempsey deserts, the selections could not have been put together better. Service from busboys to overall customer care from all staff was superb. This has been one of our favorite places to go in the Valley and it has not missed a beat since it opened! This was by far the best brunch I've had in a long time! Sorbet Mimosas, fresh fruit and a WHOLE new take on Eggs Benedict. So delicious I will definitely be back with more friends in the very near future! We had heard so many amazing reviews and had failed to get a table on 2 previous attempts to dine here. . . We finally were able to get in, it was okay, didn't see what all the hype was about, the place was okay, the food was okay there was nothing wrong with anything but it was just okay, the service was great. Our family has a Christmas Eve tradition of dining out together. We look for service, quality, ambiance, and a place where we can enjoy one another. The Gladly was the perfect match. We will make this a standard part of our tradition. From the drinks to the apps, to the entrees to the awesome sevice, everything was top notch! It's my new favorite dinner spot in Phoenix. Try the noble bread and house marinated olives to start or perhaps the chicken liver pate - both excellent choices! The service is attentive without being overbearing which I always appreciate. We are huge fans of Citizen Public House and we finally made it to the Gladly. We really enjoyed it. The food was great . The duck meatloaf is really unique and delicious. Everything else we tried was terrific. Our waiter did a great job and when he got hung up at a table one his colleagues smartly filled in, noting that our waiter was delayed, asking questions and making good suggestions. Especially loved the drinks, (Old Man and the Sea!) appetizers and dessert. I may have eaten too much to truly appreciate my main course...so next time I will be mindful of that. Modern rustic decor is one of my favorites so I loved the look, the lighting and the open feel indoors and out. The service was top notch. This was our first time and we will return to sample more of the menu. Thanks! On a stretch of Camelback lined by blocks of office buildings housing title insurers and such sits this friendly, spacious and good time-y restaurant that serves well prepared and interesting yet unpretentious food and cocktails. I think they were so shocked that we didnt order the signature mixed salad that they gave it to us anyway and I have to admit it was pretty darn good. I figured the duck meatloaf with cherries would be a meatloaf from an unusual ingredient but it screamed duck flavor (and others) and was also about the size of a brick -- suggest sharing an entree with a friend. The cocktails are nice and I was also dubious about the house Manhattan but there, too the housemade bitters (!) and burnt orange won me over. The tables are well spaced and facilitate conversation in this otherwise happily loud spot. We liked it so much we returned for an equally godo dinner a few night later. The only good part about our experience was the service. It was excellent. At 6:30 it was lovely....when we left at 8:30 we could hardly wait to leave. Recommend taking duck meatloaf off menu. Where I was sitting kept getting lights from parking lot in my eyes. Tables way too close together. Definitely not a place for elderly or people who like a lovely food experience. Went for brunch. Two of us had the eggs benedict, which was good, but the sauce was gritty, the bun too large and the meat wasn't a good match. The only side that came with it was fruit (great if you eat/like fruit). Both of us thought the benedict was a miss overall. \n\nOur friend had the omlette and really enjoyed it. \n\nMight try this place again but with all the other great restaurants in the area it might be a while. Wonderful atmosphere and location. Friendly and helpful staff serving fantastic food. \nChopped salad a must, filets with Yukon Gold Potatoes very good. The Gladly is so well-located for a nice business lunch. I had the 'Thanksgiving' sandwich special and it was a treat! Friendly service and fresh, modern atmosphere. The food was delicious! Enjoyed the special attention when we ordered the whiskey flight. A round table might have made it easier for our group of 10 to socialize during out visit. Reserve a table at The Gladly in Phoenix on KAYAK. View information about The Gladly to help decide on what to eat. On KAYAK you can also explore 5 photos and 445 unbiased real reviews about The Gladly.